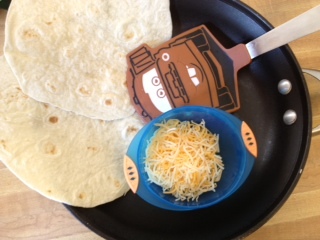 Cammy’s cooking adventure #2 was making cheese quesadillas for our lunch. 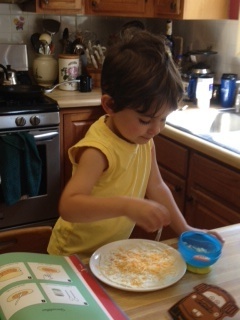 Again, we went over the recipe in “Pretend Soup” so he would know what to do. First I gathered all the makings for one quesadilla, we set up anew with tortillas and cheese for each quesadilla. We opted for just cheese, no beans. Assembling the quesadilla was great fun, he really enjoyed doing it. 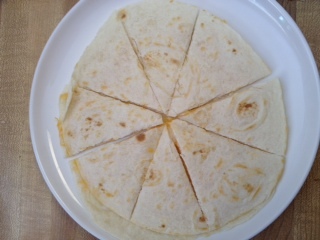 He did a really good job distributing the cheese over the whole tortilla. 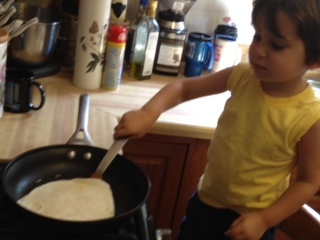 Flipping the quesadilla was more stressful, but he did really well with just a little help. While cooking one of the quesadillas, he put his hand too close to the edge of pan and that scared him, but like a trooper he assembled the next quesadilla, deciding to let me cook it. I was worried that this would turn him off, but when I told him our next cooking adventure would not need the stove, only the oven, he was very happy and is ready to make popovers.